The Monterey Peninsula is famous for its unsurpassed natural beauty, blending land and sea like no other in the world. With magnificent landscapes, compelling attractions are abundant. In Monterey, explore the world-famous Monterey Bay Aquarium, Steinbeck's historic Cannery Row and the charismatic Fisherman's Wharf. Carmel-by-the-Sea is known for its compelling art galleries and quaint little shops, while Carmel Valley is celebrated for its world-renown wineries. 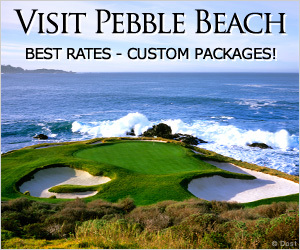 Pebble Beach features the distinguished 17-Mile Drive, Stillwater Cove and the iconic Lone Cypress. A short drive south will lead you to the illustrious Big Sur coast. Once your adventures have commenced, engage in a culinary experience at one of the exceptional restaurants on the Monterey Peninsula. Located in Pebble Beach, 17 Mile Drive is one of the most renown stretches of road in the country. Winding along a magnificent portion of the Pacific coast, the natural beauty and wildlife are unsurpassed. If you are looking for a elegant sightseeing experience, this breathtaking meeting of land and sea will not disappoint. A Taste of Monterey showcases some of the world-class wines grown in the Central Coast of California. This region is famous for its vibrant flavors generated by the rich coastal landscape. Monterey is celebrated for it's Chardonnay, Pinot Noir, Cabernet Sauvignon, Merlot, Syrah, Sauvignon Blanc. Big Sur is the embodiment of untouched wilderness. Invision granite rock formations engulfed by powerful surf creating some of California's most memorable ocean vistas. Big Sur is located between Carmel and the northern tip of San Luis Obispo County. Jack Kerouac and Henry Miller found their life's-breath of inspiration in its redwood lined canyons and vast coastline. Wildlife thrives in the region with gray whales migrating past twice a year, and endangered sea otters making their home in the rocky shores. Cannery Row is a historic waterfront located in Monterey. Author John Steinbeck brought a spotlight to this destination with his 1945 novel "Cannery Row." Once an industrial district famous for canning sardines, Cannery Row has transformed into a destination for shopping, dining and seaside activities on the beautiful shoreline of the Monterey Bay National Marine Sanctuary. The Pebble Beach Concours d'Elegance is the world's premier automobile celebration, dating back to it's inauguration in 1950. This event is a showcase of the greatest and most rare automobiles in the world. These magnificent cars are positioned on the famed eighteenth fairway of Pebble Beach Golf Links annually in August, allowing spectators to get a firsthand view. Associated with this event is the most prestigious automobile auction in the country. This landmark in Monterey has something for everybody, featuring many excellent restaurants, guided tours, and interesting shops. Whether you wish to dine on incredible seafood, go for a whale-watching tour, look at historical artifacts, or purchase exotic candy, you will find it on Fisherman's Wharf. The restaurants located on the wharf are some of the finest in Monterey. It can also be a great place to buy freshly caught fish or just walk around and look at all the sea life frolicking about. Throughout the year various special events are hosted at this historic location. Monterey Bay Kayaks offers a unique experience to outdoors enthusiasts. The friendly and knowledgable staff offer an outstanding combination of excellent customer service and the best selection of high quality kayaks and equipment. Since 1957, the Sports Car Racing Association of the Monterey Peninsula (SCRAMP) has operated and maintained Laguna Seca Raceway. Laguna Seca is host to five annual racing events including the Monterey Festival of Speed, Red Bull U.S. Grand Prix, 35th Rolex Monterey Historic Automobile Races, Corona AMA Superbike Finale and the Monterey Sports Car Championships. The Monterey Bay Aquarium offers visitors an extraordinary experience, featuring 200 award-winning galleries and exhibitions. Rated the #1 aquarium in the country for family entertainment, this aquarium is a must see if you travel to Monterey. Visit the Monterey Bay Aquarium web site to learn about ocean life, view their current exhibits or plan a visit. The Mission of the Monterey Bay Aquarium is to inspire conservation of the oceans. Whether you'd like an introduction to the area, an alternative to attractions you've already seen or an exciting rainy day option, Monterey Movie Tours is your ticket to a star-studded getaway! This fascinating two-tours-in-one outing features both magnificent landscapes and blockbuster scenes from some 200 movies filmed across the Monterey Peninsula. Monterey Bay Whale Watch offers year-round whale watching trips to observe the spectacular diversity and abundance of whales and dolphins inhabiting the Monterey Bay National Marine Sanctuary. In the tradition of John Steinbeck, the National Steinbeck Center draws its inspiration from the diverse people and the land of the Salinas Valley. Through the exploration of Steinbeck's work, they provide and support educational experiences that inspire audiences to learn about human nature, literature, history, agriculture, and the arts.